The Public Safety Store is an authorized distributor for Interspiro SCBA (Self Contained Breathing Apparatus) systems. You may have never heard of Intersprio, but some of the most advanced firefighter SCBA technology in the world was invented and perfected by Interspriro! and ask for an Intersprio Demo! Why Should My Department Give Interspiro a Try? We understand that when you go into a burning building, you want a SCBA that you know works and is easy to use. You can not fully commit yourself to offensive firefighting operations while you are questioning your life safety equipment. 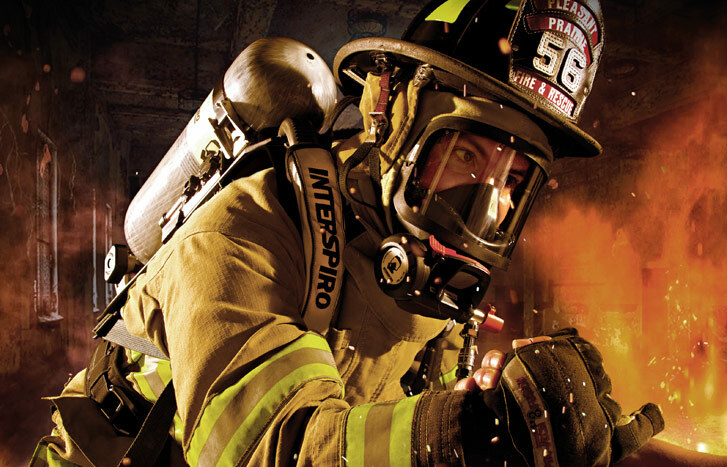 Interspiro has been manufacturing firefighting SCBA products for nearly 50 years. The technology that you are perhaps familiar with in other brands was likely invented and first used by Interspiro. With Intersprio, you get a SCBA with the absolute best technology available in a simple easy to use platform. When we say ANY firefighter can use it easily and confidently, we mean it. From the remote gauge display to the harness to changing out cylinders, with Intersprio, it's easy and it just works. Technology Is Great, But That Means It's heavy Right? NO! If you are used to the way the old wire frame technology of other air packs feel, the Interspiro harness will seem as if you have lifted a heavy load off your back. The unique S-Harness incorporates a swiveling shoulder and waist strap. Size adjustments are easy so that the weight of the entire air-pack is completely balanced. Comfort is a primary focus with Interspiro. Fatigue with other packs can come quicker if you have to continue to fight the weight of the breathing apparatus while you are engaged in firefighting operations. Intersprio allows complete weight distribution so that no one part of your body is bearing most of the weight of the system.